On February 28, we celebrate National Chili Day — a moment to pay homage to the legendary dish that brings people together, and can tear them apart. Chili is the ultimate people-pleaser, but it’s also the ultimate cook-off dish. Family recipes are guarded like crown jewels, and secret ingredients are never spoken of above a whisper. And the debates about what makes true chili — beans or no beans? —are fierce! But these are all part of what makes chili such an experience. When chili is being served — perhaps with some chopped onions and shredded cheese on top — everyone comes to the table. Maybe your go-to recipe is in your head, or maybe it’s earmarked in your favorite cookbook. Maybe you need to call your mom and have her give your step-by-step instructions. However the chili gets on the stove, get it there, and then enjoy a piping hot bowl of the good stuff. Everyone, and we mean everyone, has a chili recipe. So invite everyone over and have a chili throw down. Competition will be fierce, but so will your appetites. We mean it when we say that everyone has a chili recipe — that includes the chefs at your favorite restaurants. 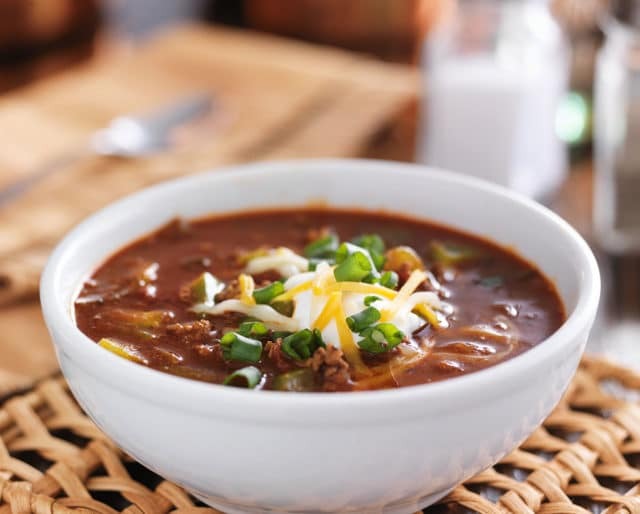 Find out which spots in your town have chili on the menu, and do your own version of a progressive dinner to find your favorite. Then next year on National Chili Day, you’ll know where to head. Some soups are barely an appetizer, but chili is a meal unto itself. A big bowl of steaming chili can warm you up and satisfy you like few other foods can. It sticks to your bones and keeps you full. Secret chili recipes are the stuff of legend — and of deliciousness. The variety in the dish is mind-boggling, and means you’ll never get sick of showing up at a friend’s house and hearing that chili being served. And chili has sprung one of the fiercest food debates there is: do beans belong in chili? Chili is the ultimate comfort food. You start feeling good the minute you open the door, its spicy aroma wafting through the air. Hold a steaming bowl of the stuff in your hands and you’re on your way to perfect culinary experience. No one misses chili night. It’s informal, cozy, and a time for people to be together.